Disclosure: this post contains some affiliate links which means if you buy something by clicking the link I will earn a small commission at absolutely no extra cost to you. 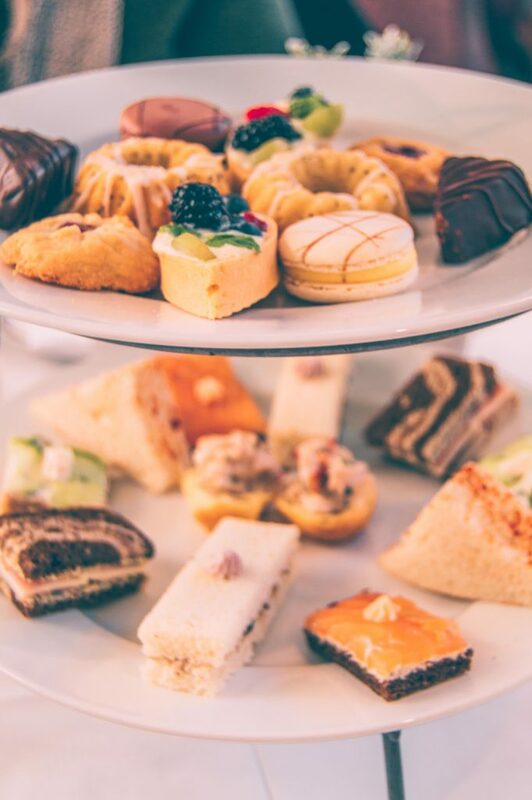 Afternoon tea is like a retreat for your body and soul: choose a beautiful venue with awe-inspiring interiors, take a close friend with whom you can share the most personal stories, and enjoy teeny-tiny sandwiches, petit fours, and gossip. There’s something very exciting about afternoon tea for me. First of all, sipping tea from fine china in the middle of the day makes one feel like royalty. Second, tiny food (for some inexplicable reason) gives me a feeling of extreme gastronomic satisfaction. Finally, after three hours of chatting and devouring sweets together you find a deeper personal connection with your friend. My love for afternoon tea was born three years ago in Sri Lanka where, inspired by the country’s colonial past, my friend Yash and I had the first afternoon tea together. We decided that it should become a tradition. When Yash planned a trip to Boston I knew exactly where to take her. 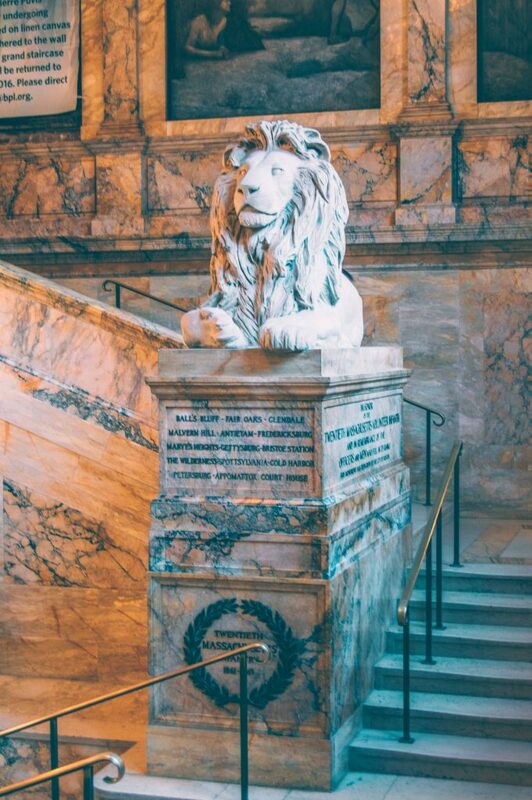 Boston Public Library, with its gorgeous ceiling artwork, grand lions guarding the main staircase, and beautiful sun-lit courtyard, is one of my favorite spots in the city. I could sit here with a book and a cup of coffee all day and be happy. But the fact that they serve afternoon tea in this majestic setting makes it a dream come true. The set up for afternoon tea is bright and clean with white linens, fine china with silver pattern, and sunlight coming from the windows facing the open courtyard. To complete the picture the menu is printed on a page of a vintage book. 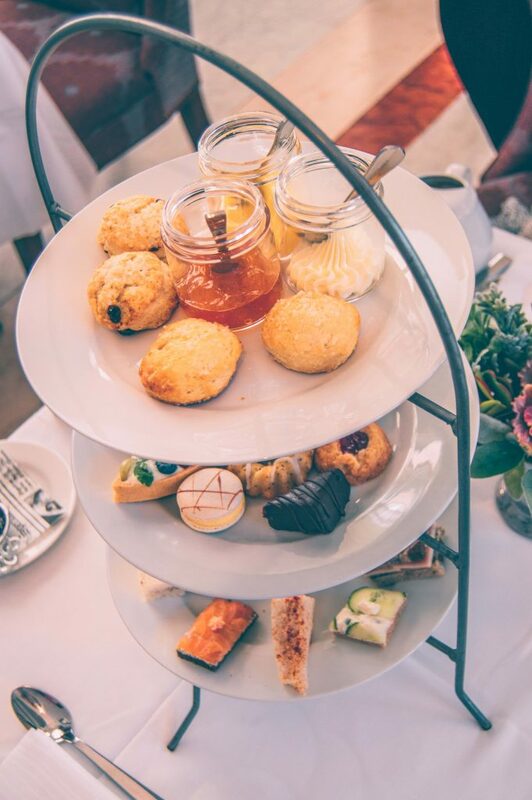 For the longest time I referred to afternoon tea as “high tea” which, as it turned out, is completely wrong. Funny enough, the correct way is to say “low tea”. “High tea”, or as it is also called “meat tea”, actually refers to evening meal of a working class served between 5 pm and 7 pm. The afternoon tea would normally be served in a sitting room where low tables (like a coffee table) were placed near sofas or chairs. Selection of sweets at the afternoon tea platter at the Courtyard restaurant. But where does this tradition take its roots? 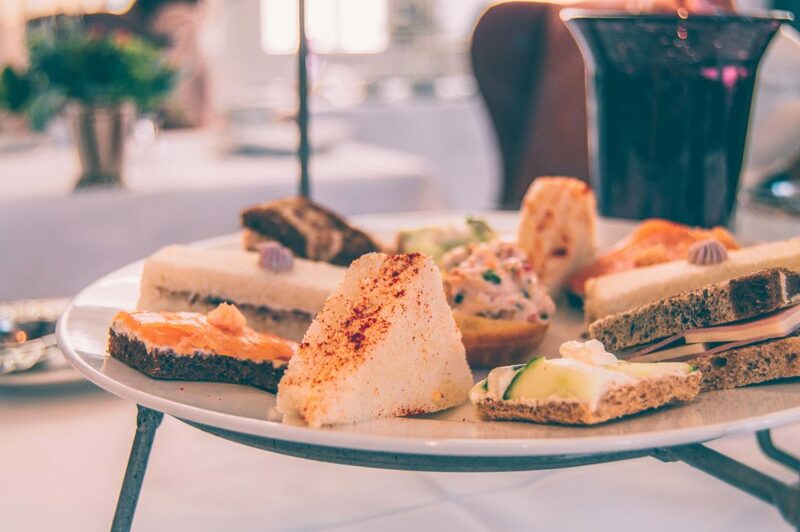 According to this article on history of afternoon tea, it was one of Queen Victoria’s ladies-in-waiting, Anna Maria Stanhope, known as the Duchess of Bedford, who came up with the idea. “Because the noon meal had become skimpier, the Duchess suffered from “a sinking feeling” at about four o’clock in the afternoon. At first the Duchess had her servants sneak her a pot of tea and a few breadstuffs. Adopting the European tea service format, she invited friends to join her for an additional afternoon meal at five o’clock in her rooms at Belvoir Castle. 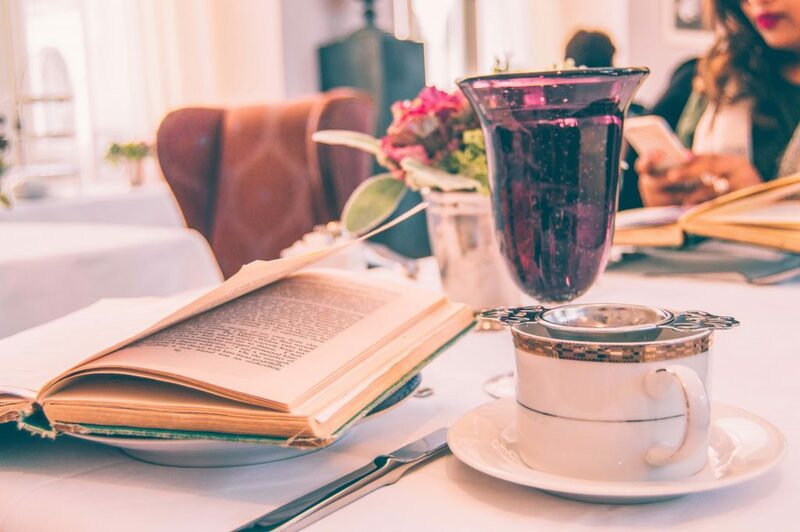 At Courtyard restaurant, you have a choice of black, green, and herbal teas. 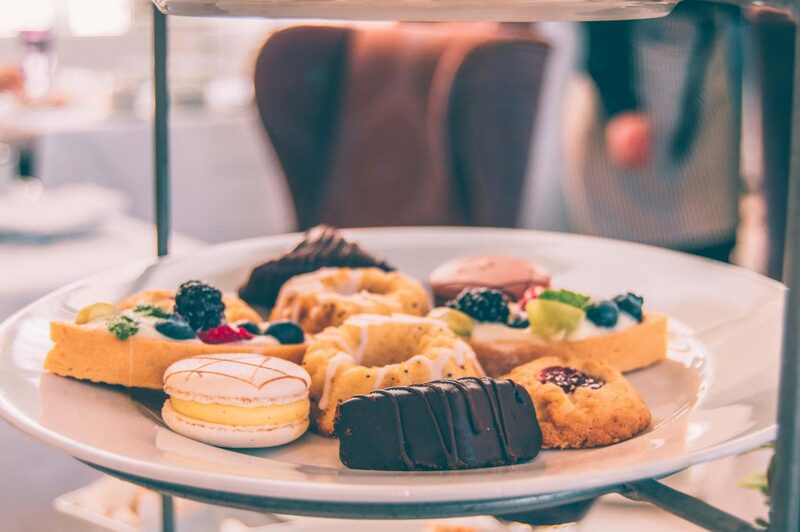 Once tea is served, a three-tier stand full of colorful little treats arrives. The lower tier features savory snacks like wild mushroom butter & watercress on pain de mie, smoked salmon & cured onion with pumpernickel, and deviled chicken & espelette pepper. 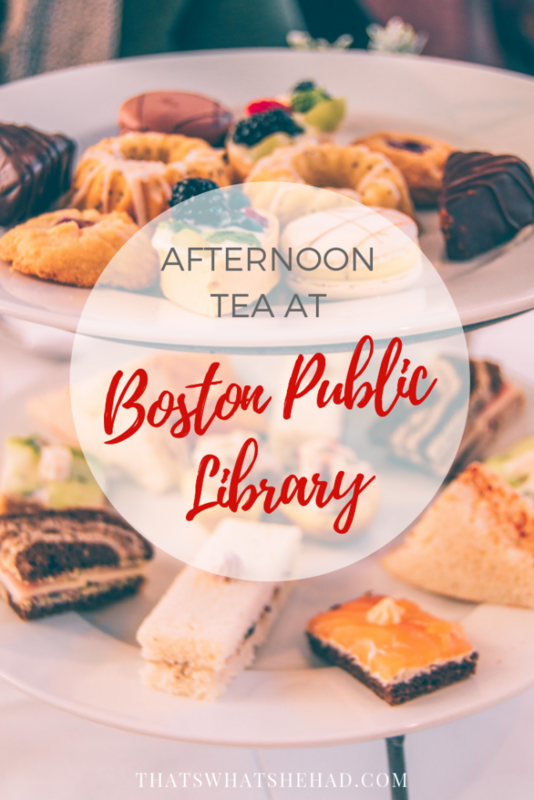 Savory options at the afternoon tea platter at Boston Public Library. Anything that has a name as impossible to pronounce as pain de mie or espelette promises to deliver a bite of pure heaven. Strictly speaking, these are tiny crustless sandwiches that were moist and full of flavor. 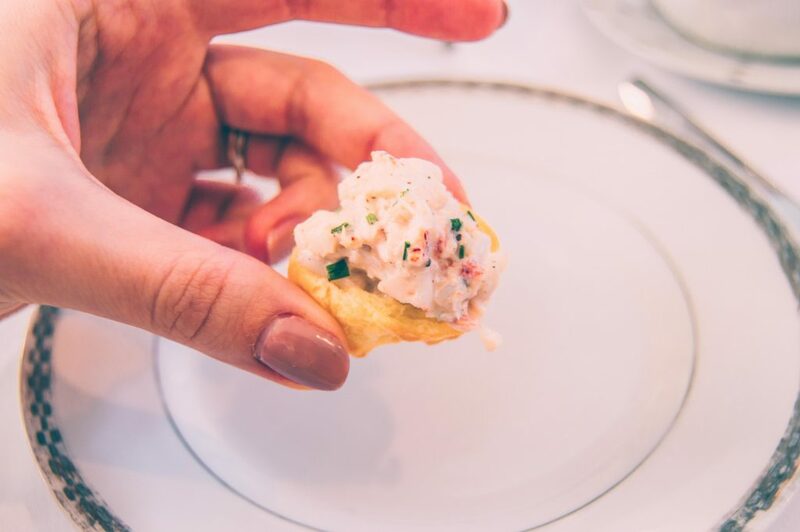 But the absolute winner was lobster salad in pate a choux. After all, we are having tea in Boston, so lobster must be on the menu. As I am much more into sweets than savories, the sandwiches were just a warm up and I couldn’t wait to get my hands on the middle tier. Where do I start? My favorite was chocolate sinclair, or what I would call a chocolate covered brownie. It had a full bodied taste of dark chocolate and rich texture. Although instead of crunchy top layer you get a layer of chocolate it didn’t feel excessive, but only made the whole thing better. Second best was a fresh fruit tartlet with vanilla crème patisserie. I love short dough pastries. Partly because I love making the dough, but also because it’s a perfect 2 in 1 combination of soft and crumbly. 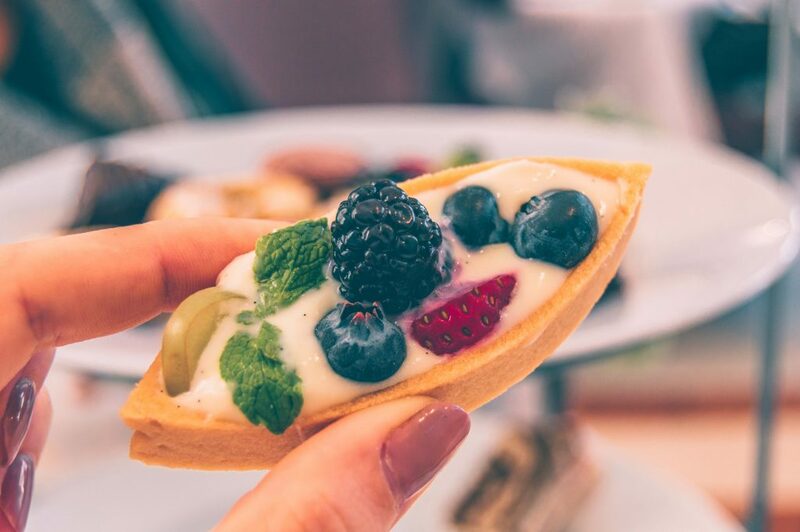 Fruits full of flavor (although it was April) sank in pastry cream, and the mint leaf on top gave the pastry a sweet final touch. Third tier featured buttery scones. 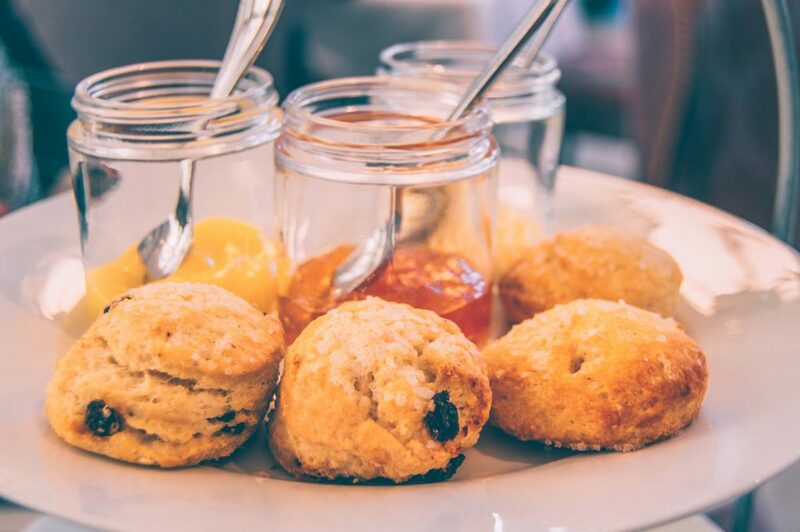 Plain and currant scones were paired with Devonshire double crème, lemon curd, and orange preserve. A good scone should be moist, light, and airy, and that’s exactly what these scones were. Topped with cream and preserve they were a perfect last accord in the symphony of afternoon tea. When all the pastries are gone and the latest rumors are covered, take a minute to walk up the main staircase to the second floor where Bates Hall is located. 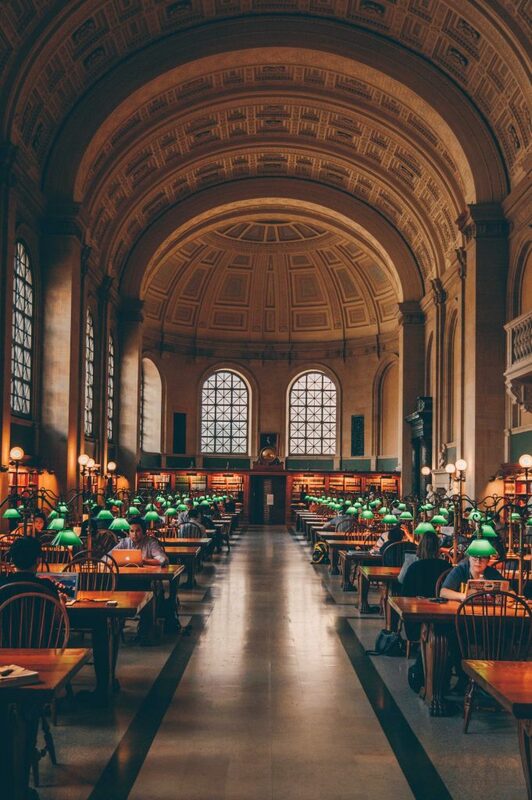 Boston Globe writer Sam Allis described Bates Hall as “the great reading room of the BPL, vast and hushed and illuminated with a profusion of green lampshades like fireflies” and one of Boston’s “secular spots that are sacred”. 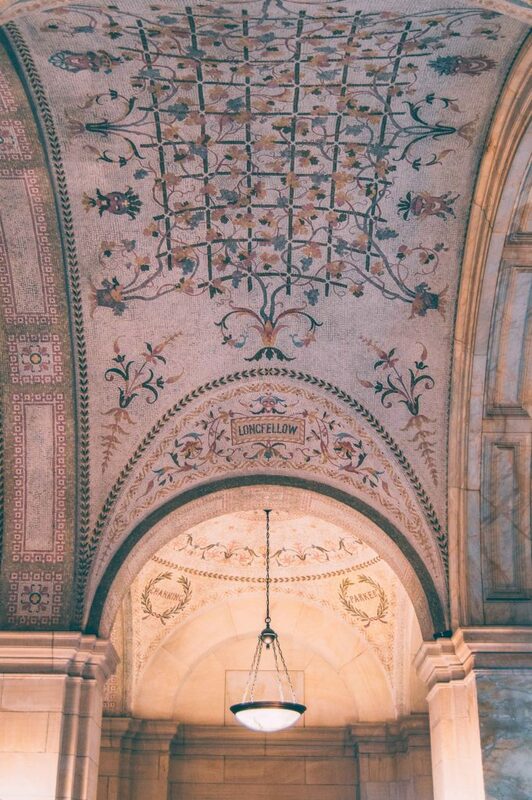 Admire the reading room that reminds of Roman basilica and the numerous people deep in their thoughts not giving as much as a glance when you roam around with camera. What Else to Do in Boston? 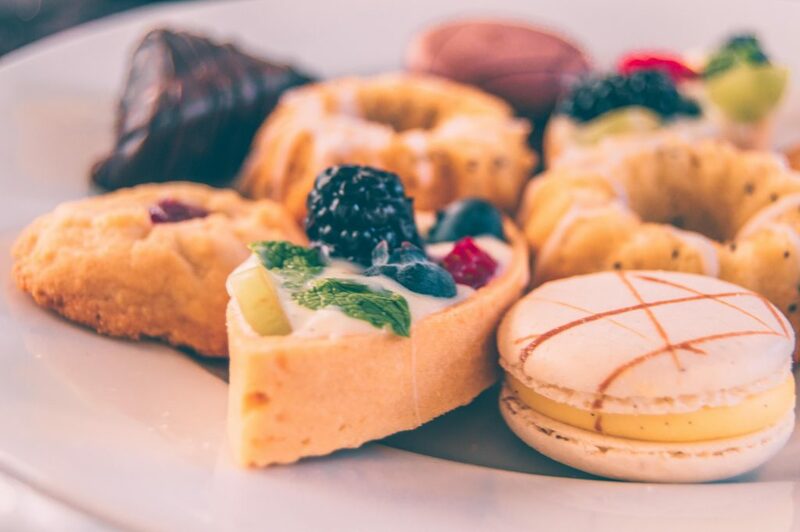 If you have a sweet tooth, check out this guide with all of my favorite sweets and treats you can only get in Boston. If you are looking for an authentic Italian pizza, check out MAST’ Boston, this is the spot a lot of Italians living in Boston frequent. If you need a step-by-step guide of things to do in Boston, read this 48 hours itinerary with my favorite spots. You might also want to cross the bridge and explore Cambridge, then this one-day itinerary is for you. If you are traveling on a budget, this guide with cheap (or free) things to do in Boston will be helpful. 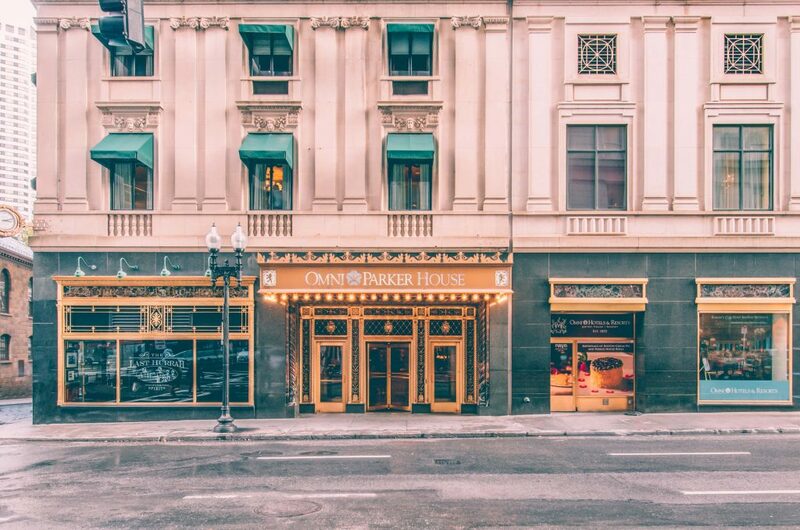 Food being my focus on any trip, no wonder I first learned about Omni Parker House because of the legendary Boston cream pie. It is here, at Omni Parker House that this popular dessert was created over a century ago! Apart from the pie (which is not really a pie, but a cake), the hotel offers old-world charm, elegance, and convenient central location. 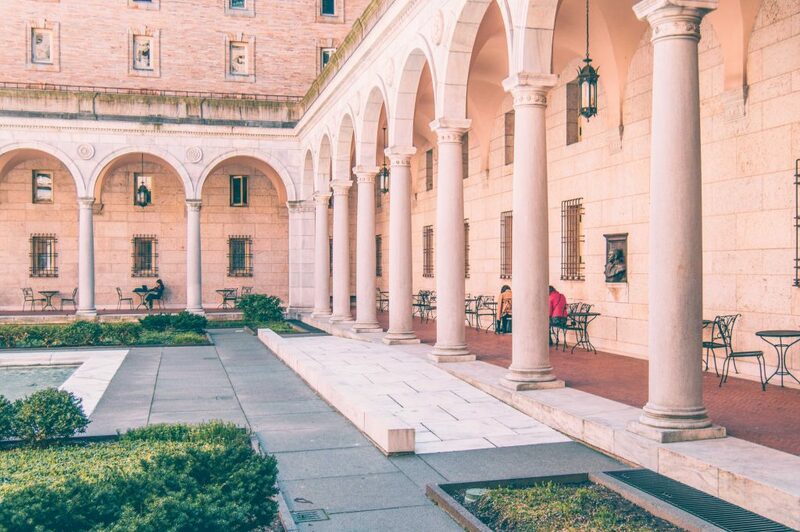 There’s another luxurious option that is on the top of my must-do-in-Boston list — The Liberty that once used to be a jail! Imagine that? Charles Street Jail, a national historic landmark built in 1851, was reinvented as a hotel and now its rooms are overlooking Charles River. It costs a pretty penny (which is why it’s been on my wish list for a while), but staying in a former prison would be a cool experience. If you are looking for a mid-range hotel, check out cozy rooms at The Copley House. 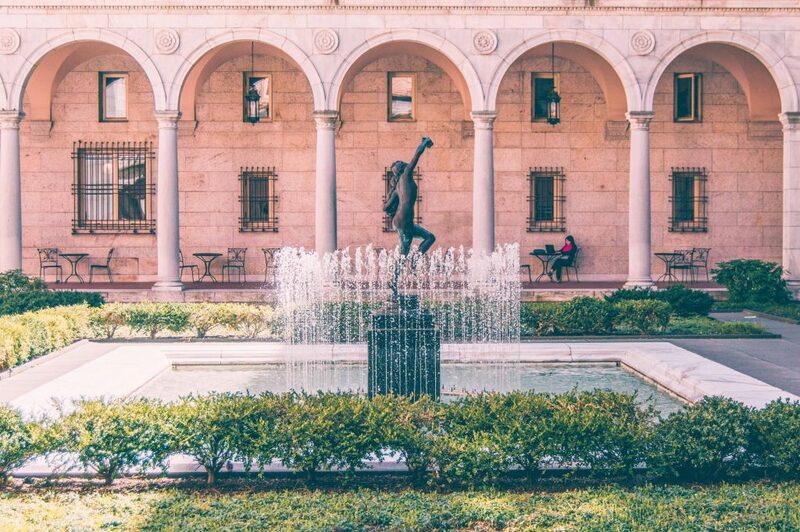 Located inside a red-brick building in the Back Bay neighborhood, it has distinct Boston vibe. 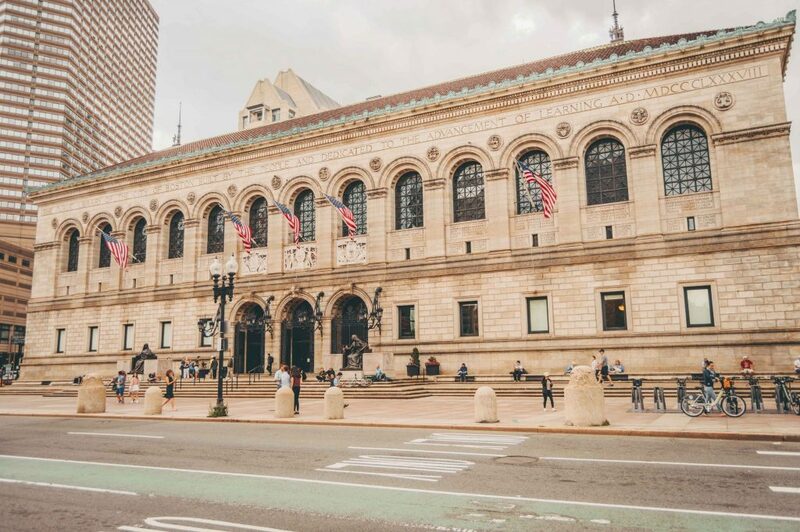 The location is unbeatable, Newbury Street and Boylston Street are 10 minutes away as well as a train station. If you are looking for something simple during your stay in Boston, a bed at a hostel might be a good option for you. HI Boston located in Theatre district, a short walk from Boston Common, is one of the highest rated hostels in the city. Great post. I had afternoon tea there as well back in January. The lobster salad was amazing. I’d go back just for that. I use to study in this library and didn’t know they had afternoon tea! I would love to go back and try it out-all the food looks delicious. I also love the quote about the reading room-really captures one of my favorite spots in Boston! Thank you for the recommendation – I had tea there just this past Thursday when visiting, and everything was delicious. Afterwards, I got to sit outside and read around the Courtyard, even while it rained. Such a great afternoon. 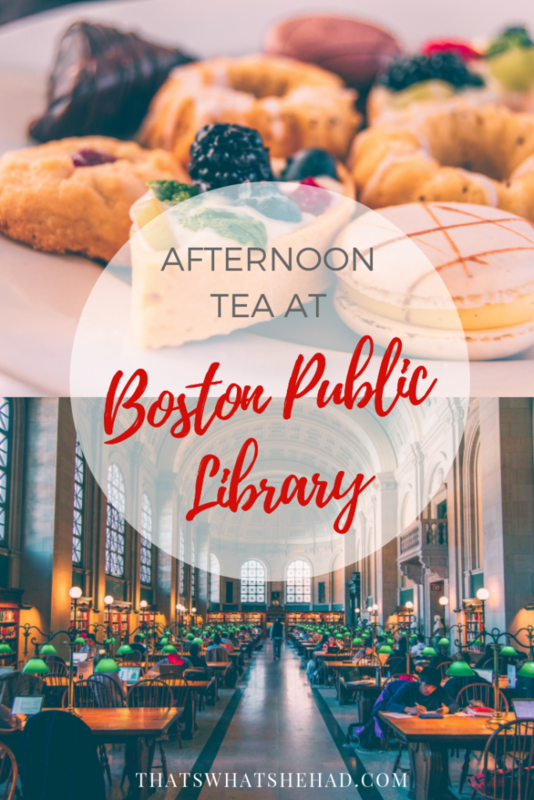 I am so happy you had great time at the library and enjoyed the afternoon tea! 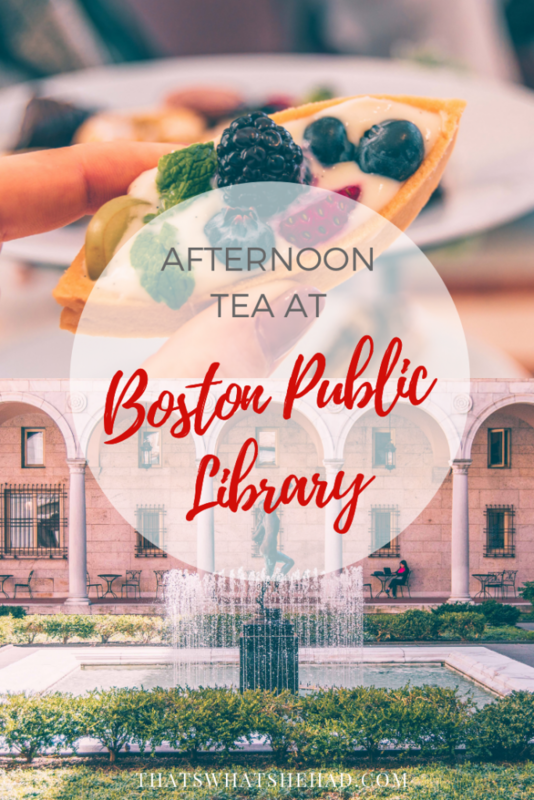 It’s one of my absolute favorite places in the whole of Boston and I am glad someone else got to enjoy an afternoon reading and eating tiny little sweets and sandwiches at this masterpiece of a library.